If you've got a slab-reefing mainsail on your sailboat, you need lazyjacks. OK, they're not absolutely essential but they'll definitely make for an easier time when pulling a slab in, or stowing the sail along the boom at the end of a day's sailing. Without lazy jacks you'd need to find some other method of controlling the redundant area of sail that's created when a slab is pulled in. Traditionally, the solution was to use reef cringles and pennants. The cringles were the rows of holes along the sail at each of the reefing points and the pennants were the short lengths of line secured through them. These are tied under the foot of the sail - but never below the boom - leaving the sail tamed and bundled along the top of the boom. Neat and tidy, but creating point loads in an unreinforced section of the sail panel. Many a sail has been damaged in this way, particularly if a reef is pulled out with the pennants still tied in. Lazyjacks retain the sail on the boom when a slab is pulled in. There's nothing high-tech about lazy jacks; just a couple of fittings on each side of the mast, several lengths of 10mm (3/8") line, a few thimbles and some padeyes for the boom. The blocks are fitted around a half to three-quarters of the distance between the gooseneck and the top of the mast and the cleats at a convenient point near the gooseneck. 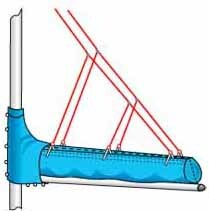 The 'cats-cradle' part of the lazy jacks will depend on the length of the boom, and the padeyes located accordingly - unless you chose to incorporate a mainsail cover as shown here. Although you don't have to use swivel blocks at the intersections of the lines - hard eyes using plastic thimbles will do at a pinch for small mainsails - the lower friction of swivel blocks make the system more efficient. 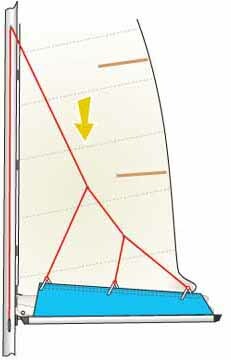 So why bother with complex, expensive in-mast furling or in-boom furling systems? You just can't beat slab reefing and lazy jacks for simplicity, reliability and value for money. It's pretty easy to make up and fit a set of lazy jacks—but even easier if you buy a kit. These kits are supplied with or without the rope (see Type C - Large Size), so make sure you're ordering the one you want. A very nifty canvas sail cover can be combined with lazyjacks. Not only will the flappy bit of the reefed sail be contained, with one of these 'stack-packs' the sail can be dropped, the cover zipped and the gin and tonics dispensed in half the time it takes to drag a conventional mainsail cover out of its locker. Whilst lazyjacks efficiently collect the main and guide it onto the boom as it's dropped, they are equally efficient at trapping the ends of the battens as the sail is raised. The solution is simple - slacken them off, pull them forward and secure them on the mast. The reefing hooks, if you have them as part of your slab reefing system, are ideally placed for this.